I have been a vegetarian since I my early elementary school days. My mom joked that I was a vegetarian who didn’t like vegetables, and while that playful statement wasn’t far from the truth in my childhood years, as an adult I have an unwavering love affair with all veggies. Where my diet lacks today is in the protein department, in part because of the fact that I don’t eat meat, but also in part because I really had no idea what the protein requirement for my body type and lifestyle was. I was recently shocked to learn that depending on my activity level (which varies from light to intense), I need anywhere between 92 and 107 grams of protein a day. This may not seem like a lot, but when you take animal proteins out of the equation, it can be difficult to fulfill that number effectively. I say effectively, because not all proteins are great. Take peanuts for example – an excellent source of protein with one ounce containing 7 grams of protein, however it also has 14 grams of fat, 6 grams of carbs and 166 calories. Not a great bang for your nutritional buck. 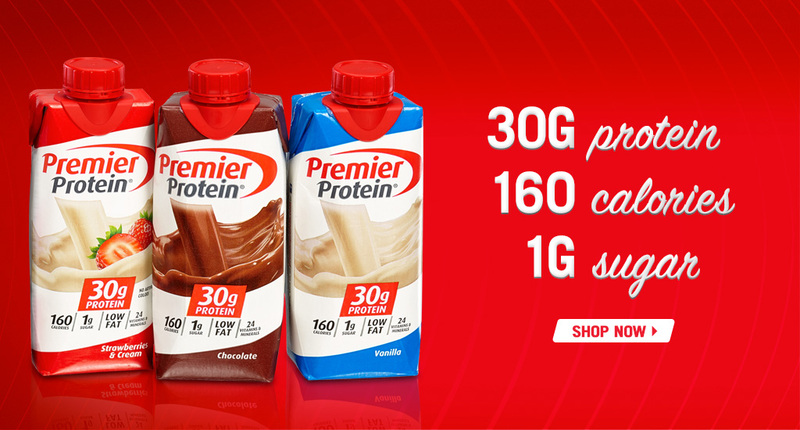 Just as portable as a bag of nuts, Premier Protein™ Original Chocolate Shake has a whopping 30 grams of protein, is low in fat, has 1 gram of sugar and only 160 calories it is my go-to option for the gym, the ball field, or just on-the-go. Like it or not, we’re all getting older – and as we age, we lose muscle mass and strength. Eating the suggested 25 – 30 grams of protein with each meal may help to slow the loss of muscle mass. Protein takes longer to digest, and therefore keeps you satisfied and feeling fuller, longer. If you’re watching your weight, or habitually snack on less than favorable items, try reaching for protein rich foods such as protein bars or shakes. If controlling your weight is a priority, eating a sufficient amount of protein, along with carbohydrates, will make your body more likely to burn extra calories rather than store them as fat. As mentioned above, protein helps keep you feeling full, longer which can also aid in weight management. We all now that simple carbs are notorious for a quick energy boost, followed by an even quicker crash. The right combo of protein, carbs and fats will give you a longer lasting more efficient source of energy. Some proteins are also found to help maintain a healthy heart. Whether it’s a weekend ball tournament, chasing rambunctious children, or hitting the gym at lunch. You need your muscle, and your muscle needs protein – both to perform as well as repair after activity. Protein is crucial in helping maintain tone and keeping you moving – and looking good doing it! 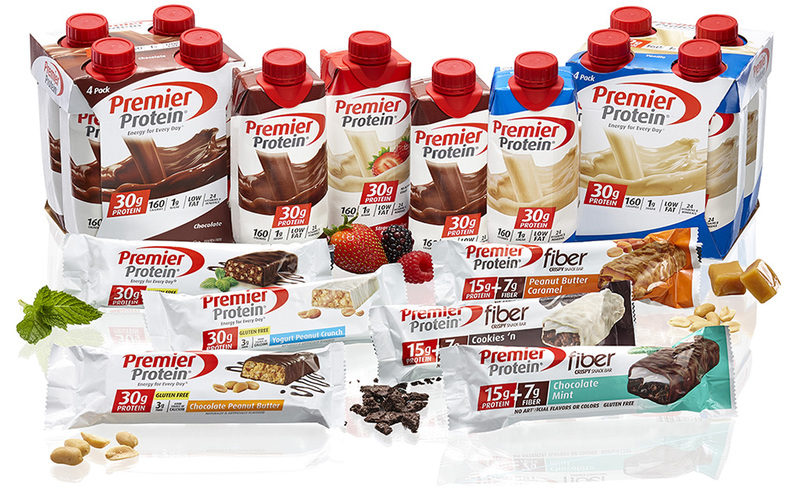 Premier Protein Vanilla shakes are available at Costco stores across Canada until April 3, 2016. You can grab the Chocolate flavour and the bars (which with flavours like cookies ‘n cream, will quickly become a staple in your pantry!) year round. Check out Premier Protein’s online calculator to see how much protein your body needs daily. 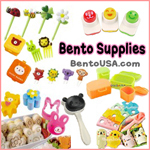 What’s your tip for making sure your getting your recommended daily intake? Being a meat eater we eat it often. I don’t know how much we actually protein wise but we get it from lots of sources from animals to beans to yogurts.. This is a great post! I knew protein was important but I didn’t realize HOW much you needed!! This good to know! That looks like a great product! I just recently started using a protein powder, so I’m totally in the learning stages with this stuff. Thanks for your informative post! As a teenager, I was mostly “vegetarian” (I cheated a lot), but I remember trying to mix various plant proteins together trying to come up with complete proteins. This sounds much easier! Thank you for having taken your time to provide us with your valuable information relating to your stay with us.we are sincerely concerned.., Most importantly, you Keepit the major.